December 2016 – Simply Organised. Simply Beautiful. Oh they are flowing at the moment, friends. On Monday night it was this that caused it. Miss 5 went in for dental surgery on Tuesday. I took the opportunity in the morning before we headed to the hospital to pop in at her Primary School to ask her class teacher a favour. Thankfully I had written a note explaining what I was asking for because I burst into tears! Yep. I held it together until I got to the car and then I let them flow. Saturday night it was because Miss 5 had her dance concert and after 18 months of dance, she has decided it’s not for her at the moment. She might come back but would like to try gymnastics next year. 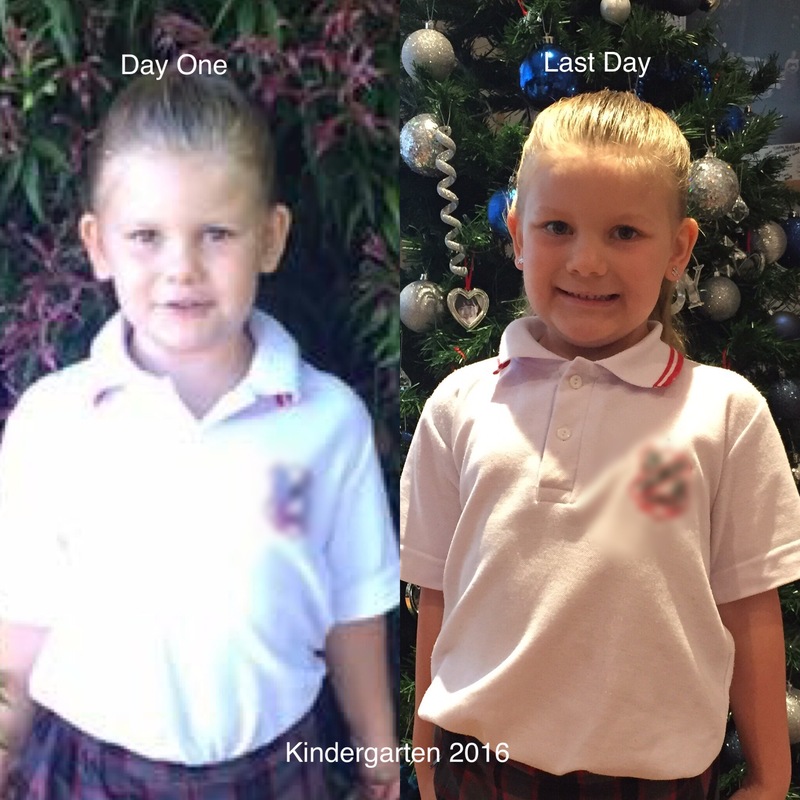 Miss 5 is growing up! I knew deep down that she was ready for Kindergarten despite not turning 5 until March. I nearly shed a tear on day one, but held it together and never actually cried. But now at the end of the year I am seeing her finish up and I am crying. She’s getting so tall. Her legs are long, lean and strong. She’s so smart with all her literacy and numeracy she’s learnt this year. She can read books to me now and count to 1000. 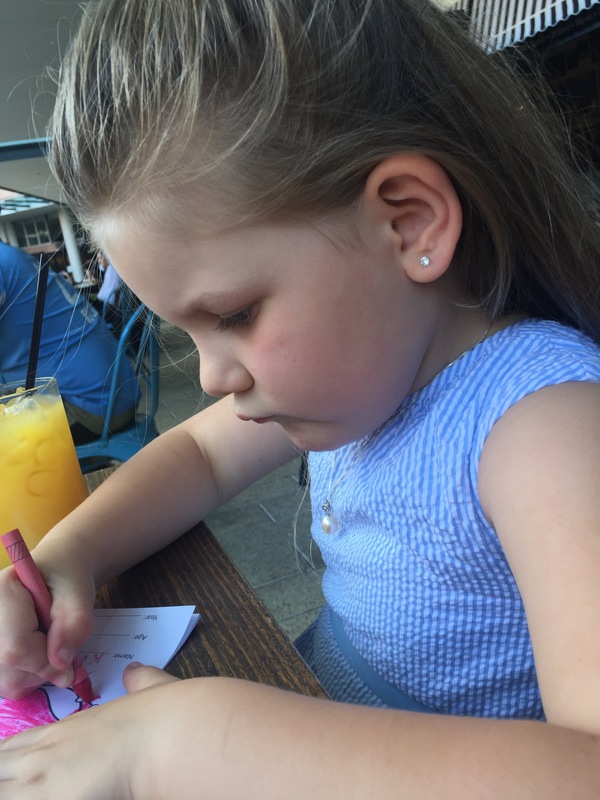 She can write her own letter to Santa and little notes to me, her Dad and her brother. She is making decisions for herself. Like with dancing. She tried gymastics and has decided to give it a go. 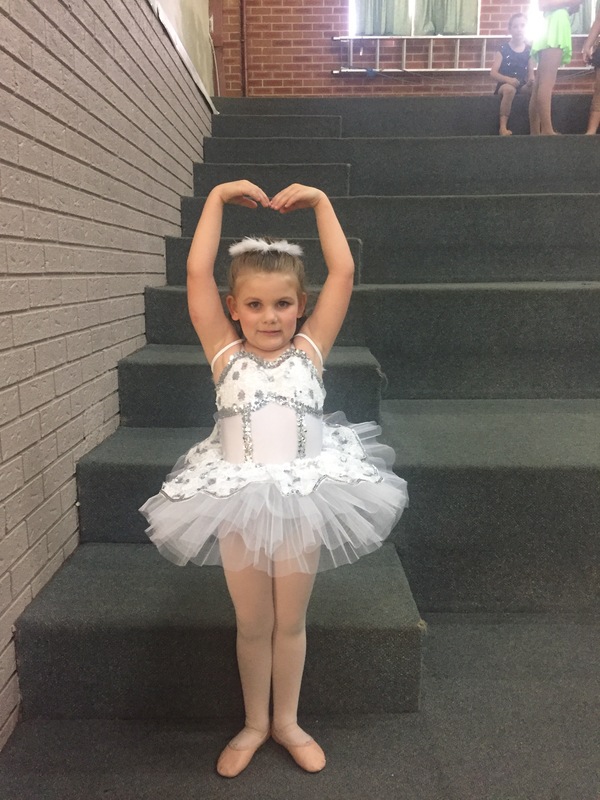 She knew she had to finish up this year of dance as she had made a commitment and she did it in style, coming home with an Achievement Award for Ballet. Everyone tells you from before they were born to not wish away the time because they grow so fast. It’s hard when you are in the fog of sleepless nights, breast feeds, nappy changes and all the ‘Why?’ questions to actually take stock and take it all in. You might try, but it’s hard. And so now here I am on day 1 of school holidays with Miss 5 joining me at work for a Family Day. She’ll head off upstairs with the other kids for some fun and games and I’ll stand to the side observing and letting her get on with it, helping when asked. She’ll then spend the afternoon in our lunch room with a co-workers daughter (around 11 years old) being an even bigger girl, trying to impress. The favour I asked of Miss 5’s Kindy teacher? It’s an idea I got from a Facebook group I am in. You purchase Dr Seuss’ “Oh, The Places You’ll Go” and give it to your child’s teacher each year. You ask them to select their favourite page and write a message to your child. You then present it to them at Graduation. So tell me, are you a basket case of tears at the moment with how big your kid/s have gotten? Is it the end-of-year overwhelm? Do you know the secret to make it all slow down? Tell me! 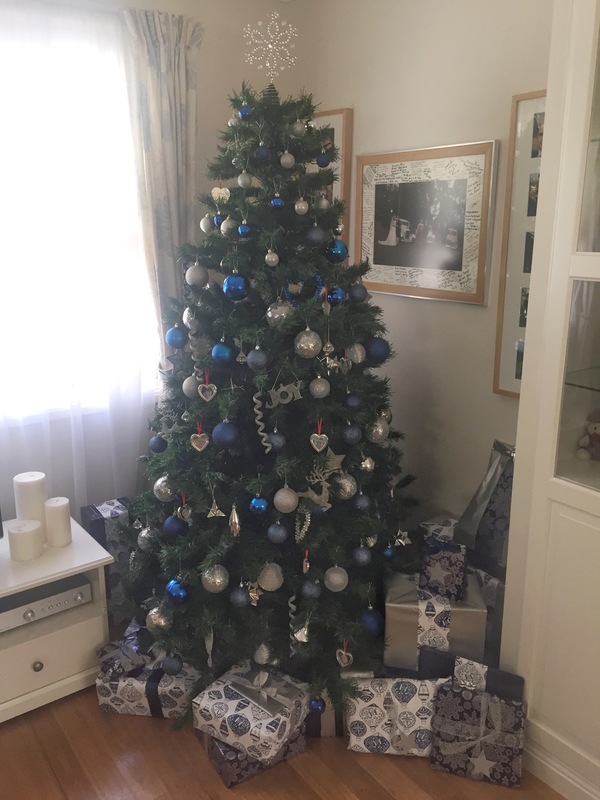 Last week I showed you my blue and white Christmas tree. This week I’m going to show you a few Christmas DIY projects that I have completed. 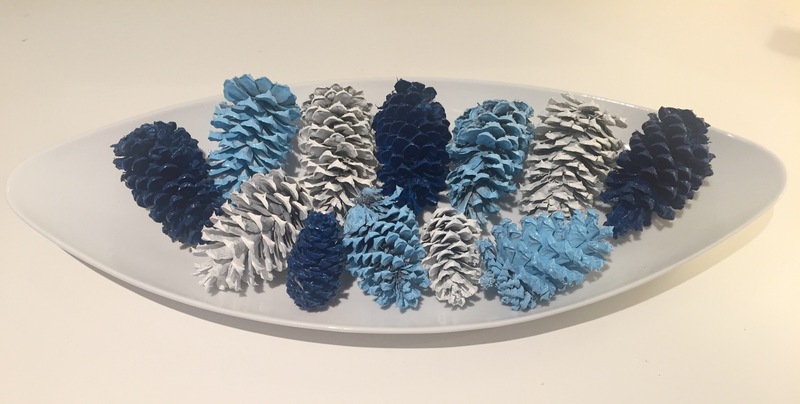 In the hallway I have grabbed a white platter from the kitchen and filled it with pine cones that I collected from a local football field. I simply sprayed these with spray paint from Bunnings in white, light blue and dark blue. The pine cones were free but the spray paint probably came in at near $30. I will just need to find something else to spray paint to make the cost worthwhile. I love them! Something that I have been meaning to do for a while (since January 😳!) is make this DIY artwork for above the fireplace. In the January sales I purchased this silver star from Bed Bath N’ Table for $15 ish (RRP $34.95) with the idea of cutting it in half, mounting it to an indigo sheet of cardboard and placing it inside a frame from IKEA. It took me about 10 minutes to put this together and I love it. I cut the cardboard to size to fit the frame and removed the glass. I then used a Stanley knife and kitchen knife to cut through the styrofoam. I then used Tarzan Grip glue to adhere the star to the cardboard and then weighed the star down and left it laying down for a good while to ensure that the star adhered to the cardboard. 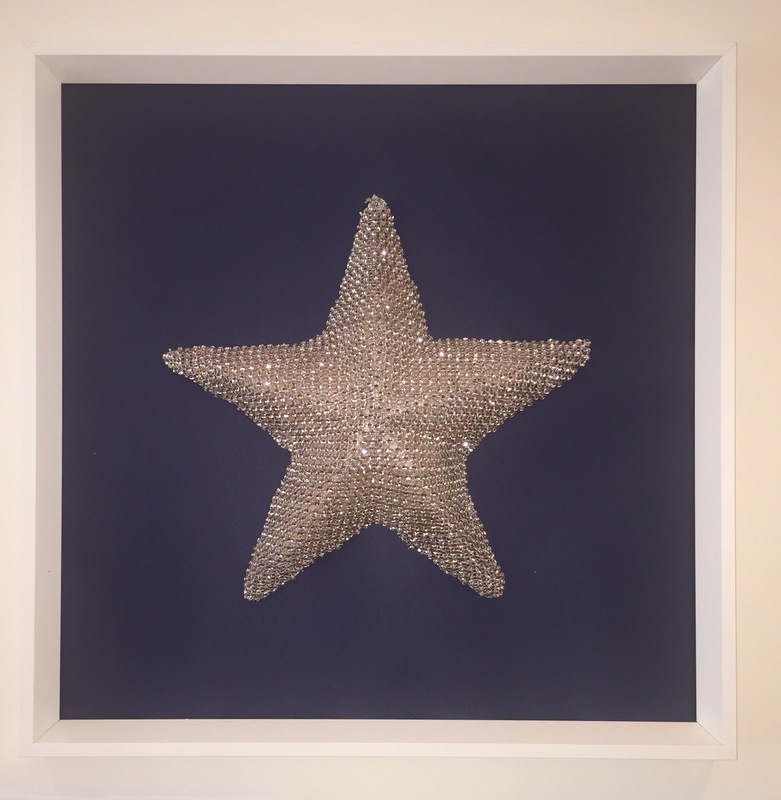 The bonus to this artwork is that I have given the other half of the star to my friend and she will make the same artwork with a sheet of coloured cardboard to suit her interiors. The silver star was around $15, IKEA frame was around $15, cardboard was under $1 and I had the glue at home already. I will probably use this in our entryway all year round when I re-do the artwork at the entryway next year. With the decision to move to a blue and white Christmas, I knew that I would need to get the kids new stockings. I also knew that I would need to be frugal in doing so as I had spent quite a bit of money purchasing their red and green stockings and having their names embroidered on them. 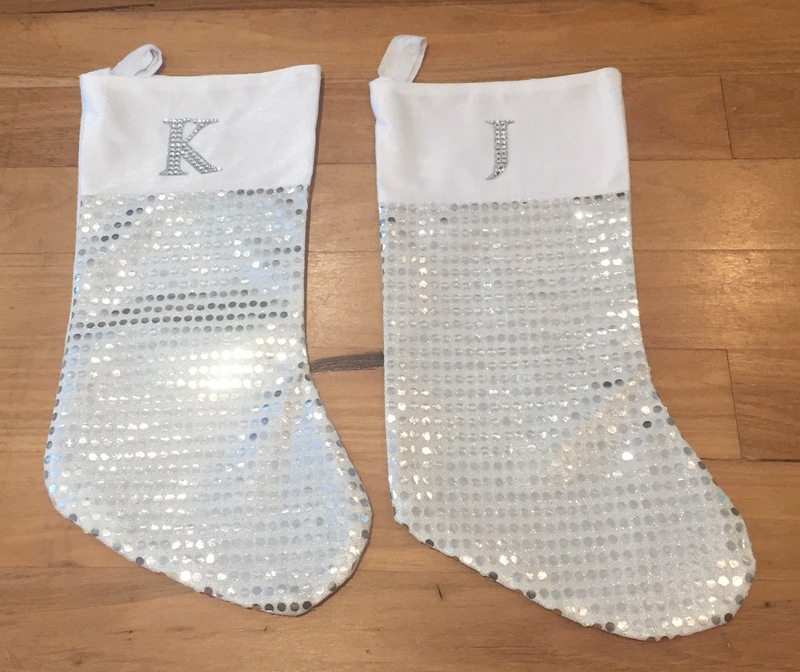 I picked these sequined stockings up from a $2 shop for $2.50 each and then had a look in their craft/scrapbooking section and picked up the diamontè letters for $2.50 as well. $10 for two stockings and I think they look great. MumO managed to find me some battery operated fairy lights for my wreath at the front door. I love the faux pearls attached as it means the wreath looks lovely through the day as well as at night. I like putting trees in the kids bedrooms. 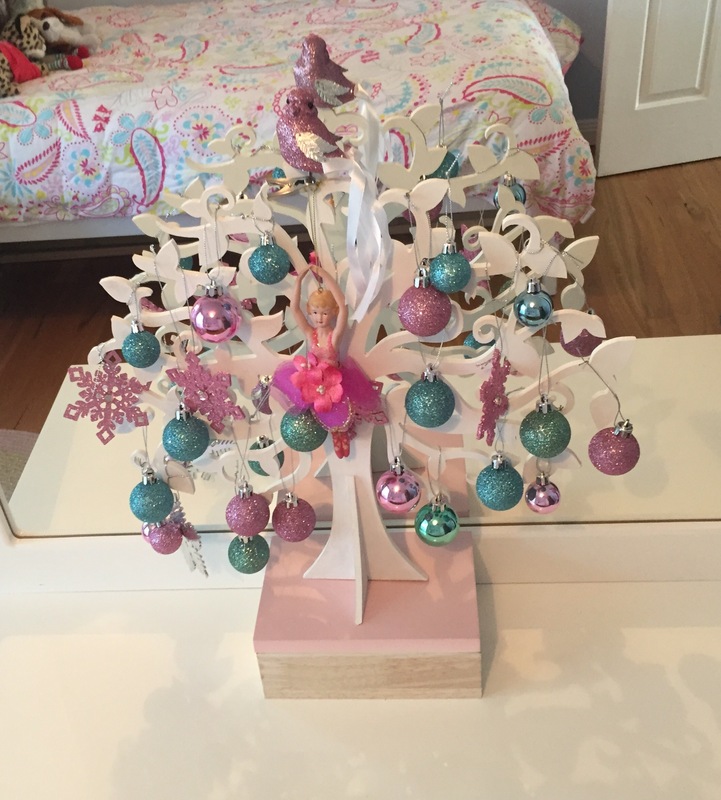 In my daughter’s room, she has a wooden tree from Spotlight which I purchased about 3 years ago now. I painted it white and this year purchased some pastel coloured decorations from Woolworths for around $16. I probably could’ve gotten away with only spending $8 as there were about half of the decorations left over. In my son’s room, he has a light grey, Scandi looking tree from Domayne that I purchased in the sales in January. 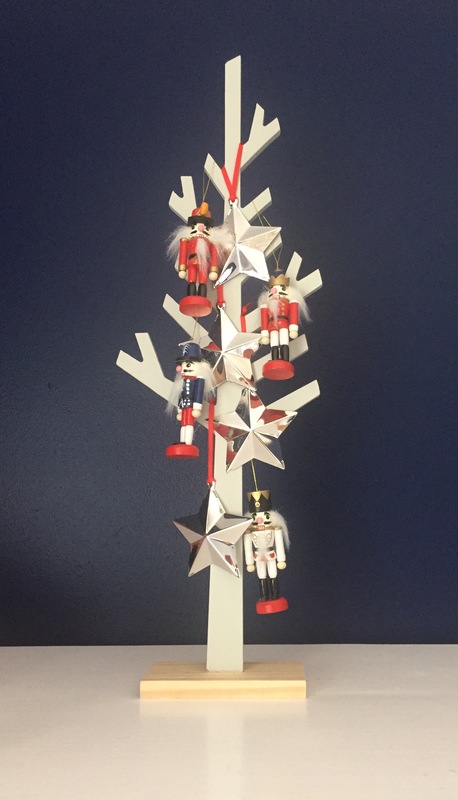 He has silverplated stars and Nutcracker men that I purchased in the sales from David Jones about two years ago. The final tree that we have in our home is our international ornament tree. 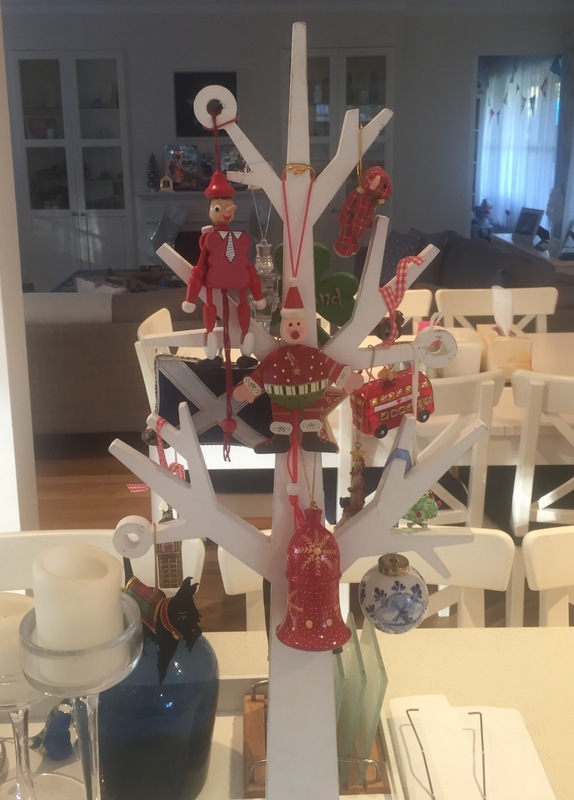 I purchased the wooden tree in a local shop around 9 years ago. It is decorated with ornaments that were mostly purchased on our honeymoon in 2007. So, that’s the DIY projects done for this year. 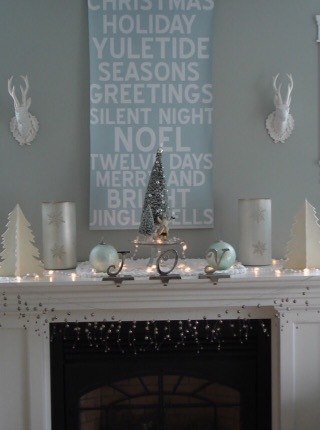 I would like to replicate something like this artwork for above the fireplace for next year if I stick with the blue and white theme (which so for I AM LOVING!!!) but until then, I am done. So tell me, do you like a bit of DIY action at Christmas? Any projects you’d like to share with me? I am quite a traditional person at heart and have always had a green tree with red, gold and silver decorations. This was the way it was growing up and what I continued to do when I moved in with my Hubby and we started our own tree. I started buying some blue decorations in the sales in January this year and stored them away with the rest of the decorations. I was so excited to pull this look together I broke another tradition. I’ve always been a December 1 gal but I was so excited it went up on 19 November! Now this is how I assemble my tree. Step 1: assemble the stand (if using a basket for the tree instead of a tree skirt, put the stand in the basket now) and first layer of branches. Fluff out the branches. Step 2: add the next layer and fluff out the branches. Step 3: continue until all layers completed. Step 4: plug the fairy lights in and check they are all working. Step 5: put the fairy lights on the tree, starting from the top and working your way down so you don’t have the balance of the power cord hanging from the top of the tree. Tuck the lights in to the branches. Step 6: place the tree into its position in the room. Step 7: start adding your baubles and decorations to the tree. Small decorations at the top, large decorations at the bottom and any special decorations, pride of place in prominent positions on the tree. Step 8: continue on and stand back periodically and fill in any gaps as you go. Step 9: pour a glass of wine because by now your nerves are probably frazzled!!! 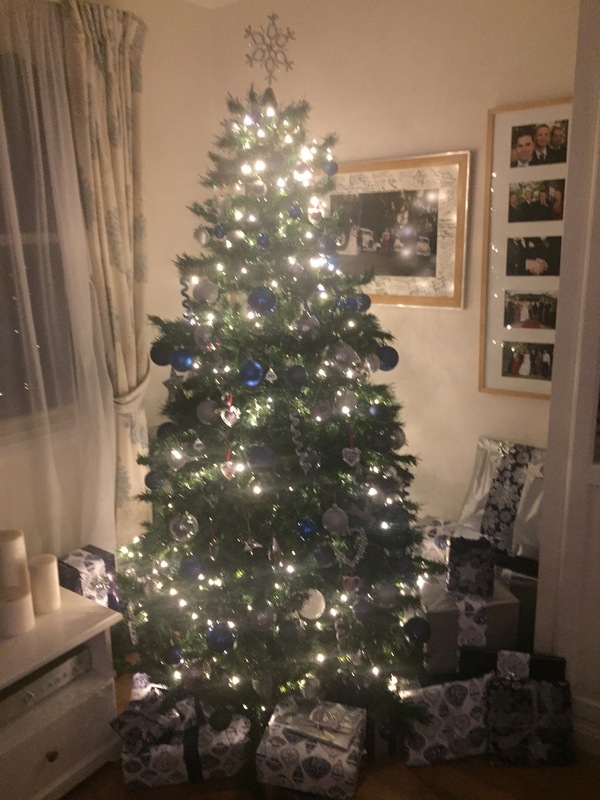 This is our tree completed! 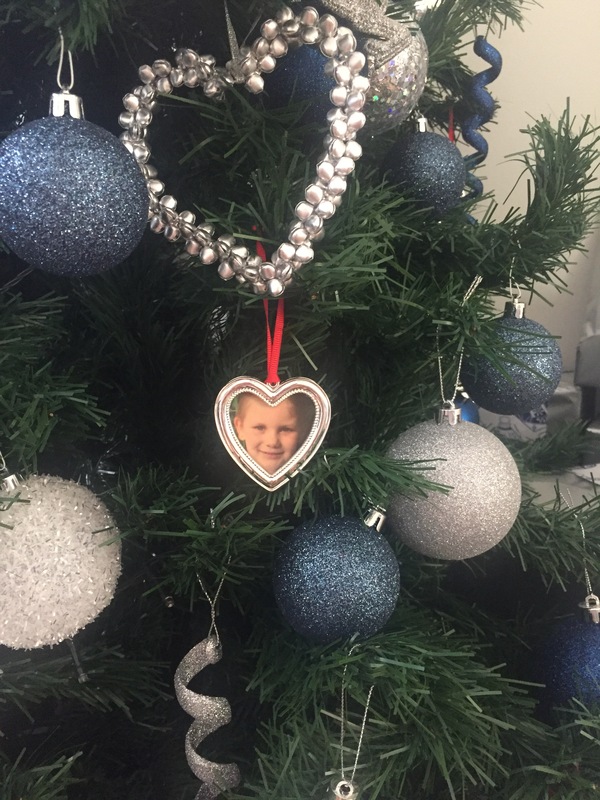 Last year in the sales I bought these love heart photo frames from David Jones for the tree – 14 of them! I wanted to take headshots of all our family members and hang them on the tree. I love it! I’ve made a few decorations to fit this new theme and will share them all with you next week! So tell me, what colour theme do you like to go with? Do you let the kids help decorate the family tree?